Switching things up on the blog to not just include tarot but to include reviews of books that are close to my heart and making a big impact on my radical body love journey. 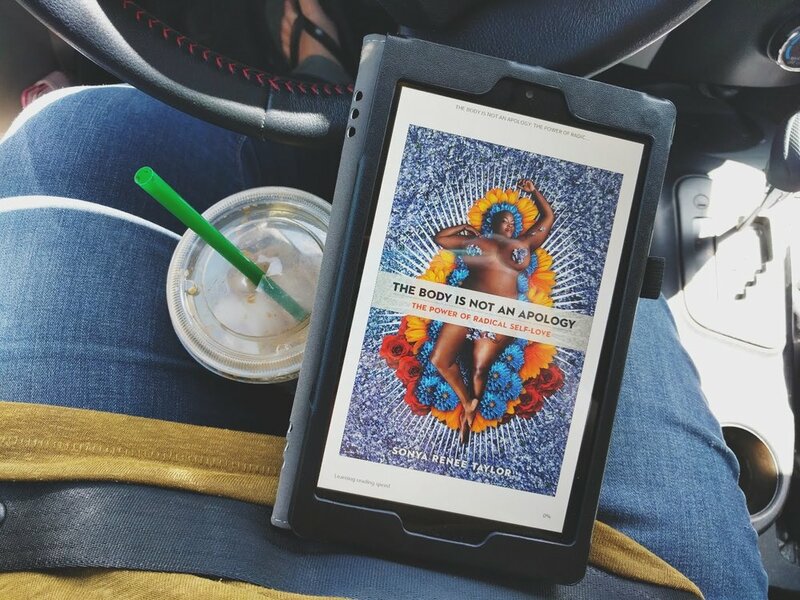 I just finished up reading The Body is Not an Apology by Sonya Renee Taylor and I thought I would share my thoughts on the blog. Sonya Renee Taylor is the author of a few books, one of which is coming out this May and is called Celebrate Your Body, it's aimed for children and teens. Sonya is the Founder and Radical Executive Officer of The Body is Not An Apology. She is also an award winning poet and activist. You can read more about the author here. I loved this book! It was inspiring and eye opening. Just when I didn't think I could learn anything new, I was smacked in the face by the words Sonya has written. This book not only talks about your body but the impact we make on the bodies around us... disabilities, POC, trans, fat bodies, and more. Sonya talks about body terrorism and how it shows up in our daily lives, our communities, and in our media. This book really put some things into perspective for me that I didn't think I was doing or things that I may have overlooked, some as simple as words we use. I highly recommend this book to anyone, especially if you are interested in all bodies and how you can help make a difference in your life as well as help others around you. FYI: I am not driving in the picture above, I'm parked in the parent pick-up line for an hour, just thought I would note that. The month of April is on its way out, well... not yet, but it's getting there! I thought I would share my "currently" things with you on the blog today! A little bit of tarot and a little bit of everything else. If you follow me on Instagram, it's pretty clear what deck I'm loving the most right now - the Oliver Hibert Tarot! I'm obsessed! This deck has been my everything since it arrived, I really adore it to pieces. If you missed it, I did a review on this deck and it can be found here. I'm really thinking about adding in a few favorite decks back into rotation but I feel so guilty when I don't use my Oliver Hibert deck, it's like it knows it's not being used, haha! The two decks I want to add back in are the Next World Tarot and Mystic Mondays. Oh how I adore those two decks! I'm not a huge TV or movie viewer but I do like to watch a lot of YouTube video's. Lately I've been obsessed with Michelle Elman's channel, it's been giving me so much life and inspiration this past week! Her video's have been a major help in my body love journey. As far as Netflix and such, I've been binging on paranormal and UFO documentaries, like usual! We have been watching the new Roseanne and I'm still not sure what I think about it... it's funny, but eh. Oh boy! I've been reading a lot lately. 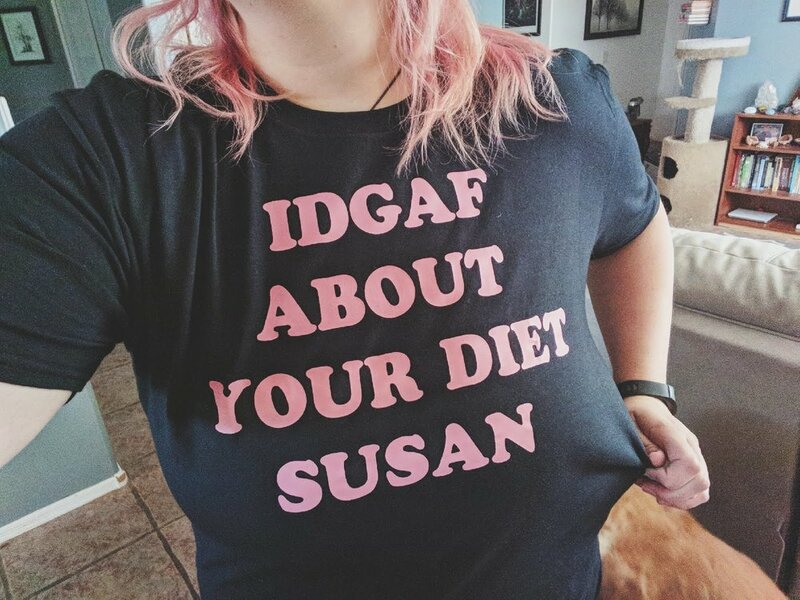 I've recently read a few books and they have all been under the topic of body positivity and fat acceptance, though I do have a few tarot books to get back to! My favorite lately was Things No One Will Tell Fat Girls by Jes Baker. I loved every word of this book and may read it again once I get through some of my other books. It's not only written by an amazing blogger (The Militant Baker) but she's an Arizona local, love! I also just finished the book Big Bones by Laura Dockrill with the BOPO book club on FB. This is a Young Adult fiction and I just adored this book, our book for May is Come As You Are by Emily Nagoski. I also discovered Rachel Wiley and binged on her book of poetry called Nothing is Okay, this is a must read!! If you read my last post, Transformation, it's pretty clear what is on my mind this month - body love! I've been obsessed with this journey but it has its ups and downs. I've also been brainstorming more ways that I can use tarot on my journey to help others who are on the same journey! I'm hoping to bring some fresh things to my blog as they become more prominent in my life, so stay tuned for all of that to come. What are you currently loving on right now? I want to know, leave a comment below!